Norton or Avast, which antivirus software is a better choice in 2019? Read this ultimate, data-driven comparison to make a wise decision. The number of malicious programs out there continue to rise with every passing year, which means it becomes imperative that you use an antivirus software – at least a free version if not a premium one – to not only shield your computer against malware but also safeguard your digital activities. It goes without saying that malicious files can cause a lot of damage to you and your computer; they can steal your sensitive data, corrupt your other software, hijack your important files for ransom, cause your computer to malfunction, and more. Norton (also called Norton by Symantec) and Avast both are well-known antivirus software companies that offer different security suites (plans) for your digital safety. At times, it becomes a difficult task to decide which software and plan you should choose for your computer. So, this ultimate guide will give you an overview of what features are included in different security suites offered by Avast and Norton, as well as how both software stack up against each other in terms of protection, system impact, cost, and more. 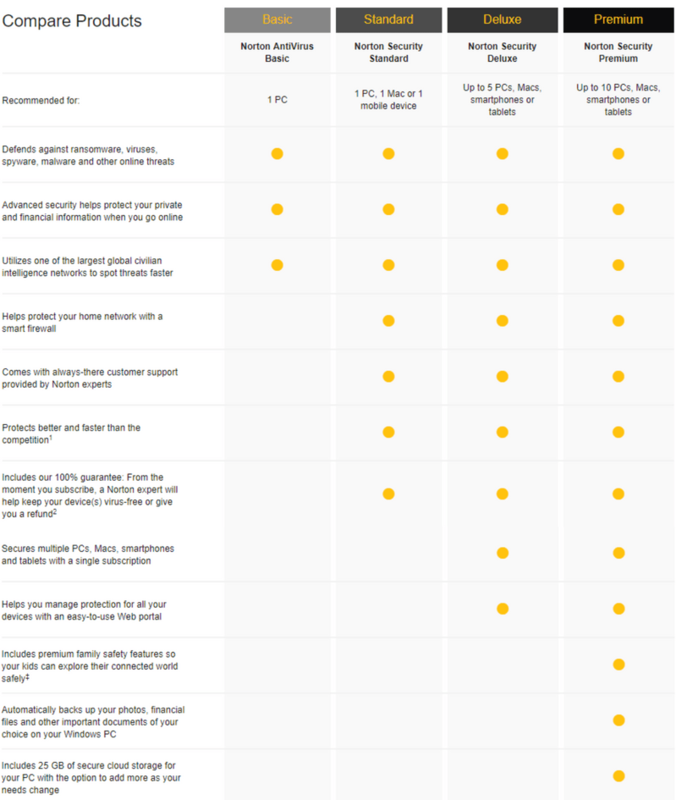 Before delving into details, let’s look at different security suites Avast and Norton offer. Avast is a better choice as it offers more security-related features and extra utilities in its security suites than Norton. Independent tests prove that both software provide excellent malware protection with minimal impact on system performance, but Norton returns too many false positives. What is Included in Avast’s Antivirus Suites? Avast Free Antivirus is one of most comprehensive (and popular) free security solution available in the market. It not only provides all the essential security-related features but also includes several bonus utility tools that most other antivirus companies charge for, such as WiFi Inspector (checks for vulnerabilities in your home network), Silent Mode for interruption-free experience, and a password manager. It will also allow you to create a rescue disk to crush hard-to-remove malicious infections and also has a browser plugin cleanup option. Software Updater, which is also part of Avast’s freeware, tells you which of your software are outdated, but you’ll have to update them yourself. Email and web browsing protection are also incorporated in the free plan. With Avast Antivirus Pro, you get everything in the free plan plus Sandbox (lets you test and play with potentially dangerous files in an environment separate from your PC), a Real Site feature (protects against fake websites and hackers), premium customer support. Next up is Avast Internet Security — the company’s most popular suite. It includes an advanced firewall, an Anti-spam filter to provide safety against phishing and junk emails, an extra layer of protection against ransomware, along with all the features included in the “pro” plan. Avast Premier adds webcam protection (prevent hackers from spying on you), Data Shredder for permanent deletion of sensitive files so no one can recover them, and automatic apps update feature. 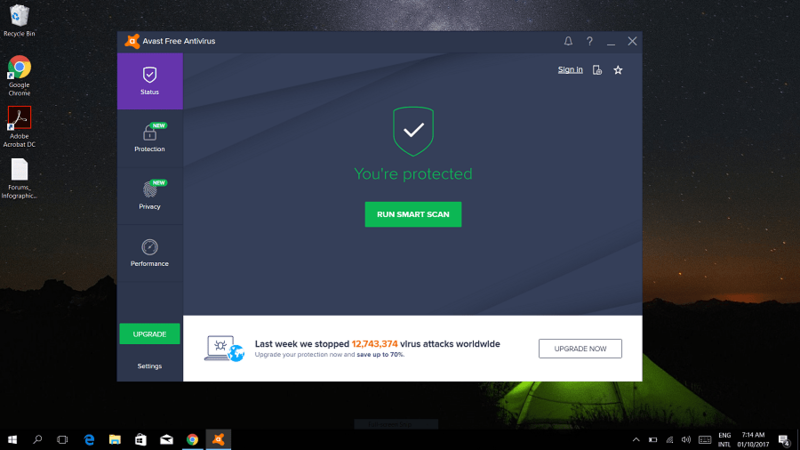 Avast Ultimate includes everything in the ‘Premier’ plan plus Cleanup Premium (lets you speed-up your system performance by cleaning junk files), a VPN, and Avast Passwords Premium. Note: All the Avast utility tools are available as separate downloads and can be purchased separately. You can also avail the free trial versions of all utilities. Each member of the Avast family will allow you to run the following scans: full scan, smart scan, file/folder specific scan, and boot-time scan (checks for malware before the Windows loads up). Avast also offers two browser plugins: Online Security and SafePrice. The former warns you about dangerous websites and blocks those involved in phishing while the latter is an online price comparison and coupon code finder tool. Note that all of the above suites only work with Windows. Avast offers two separate antivirus products for Mac platform: Avast Security and Avast Security Pro. Avast Security Pro exposes WiFi intruders and adds a ransomware shield to make sure that none of your personal files and folders can be encrypted. Unlike Avast, Norton doesn’t offer a freeware. Instead, it offers Norton AntiVirus Basic, which includes protection against spyware, viruses, identity theft, and other online threats. It effortlessly removes hard-to-remove malicious infections and also protects you on social media sites. But note that Norton AntiVirus Basic is only available for Windows platform. Norton Security Standard takes protection to the next level; it includes a smart firewall to police your home network, premium support, and a 100% refund guarantee if Norton experts fail to “keep your device(s) virus-free.” With a single subscription, this plan protects one PC and one Mac or mobile device. With Norton Security Deluxe, you get everything in the ‘standard’ plan plus a web portal to manage all of your devices at one place and protection for up to 5 devices (that can be PCs, Macs, tablets, and mobile devices). Other useful features included in this plan are a disk optimizer, a file cleanup tool, and a startup manager (lets you manage which files run at the computer startup). Norton Security Premium suite adds Family Premier (enables you to set different parental control features for your children), automatic backup of selected files from up to 5 family devices, and a 25 GB cloud storage. Note: Norton utility tools, such as Family Premier, Online 25GB Backup, Computer Tune-up, WiFi Privacy, are all available as separate downloads, and can be purchased separately. You can also avail the free trials of most utilities. Norton Boot Recovery tool (available as a free separate download) allows you to create a rescue media to crush malware that prevents computer start-up. Norton also offers a silent mode that suspends signature updates and notifications. 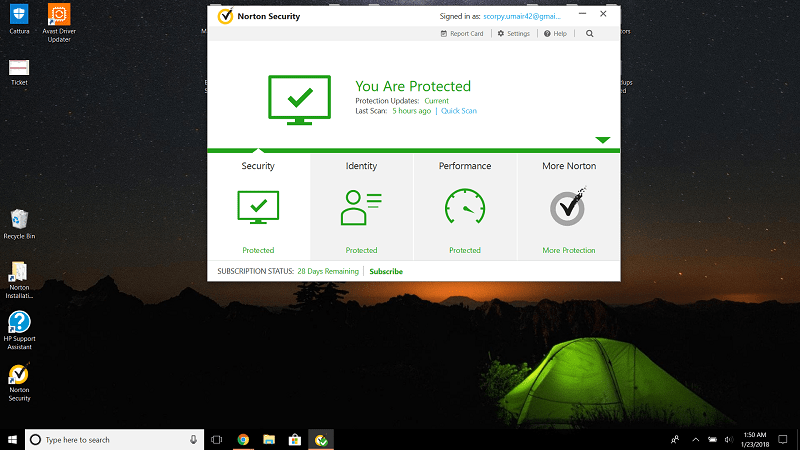 Out of the four extensions that Norton offers, only two of them are handy — Identity Safe, which is a free password manager, and Security Toolbar (protects against scam websites and identity theft). Surprisingly, none of the Norton security suites include tools that have become common in antivirus products like a home-network scanner, a file shredder, a software updater, a hardened web browser, or VPN. Also, Norton doesn’t offer webcam protection in any of its plans. 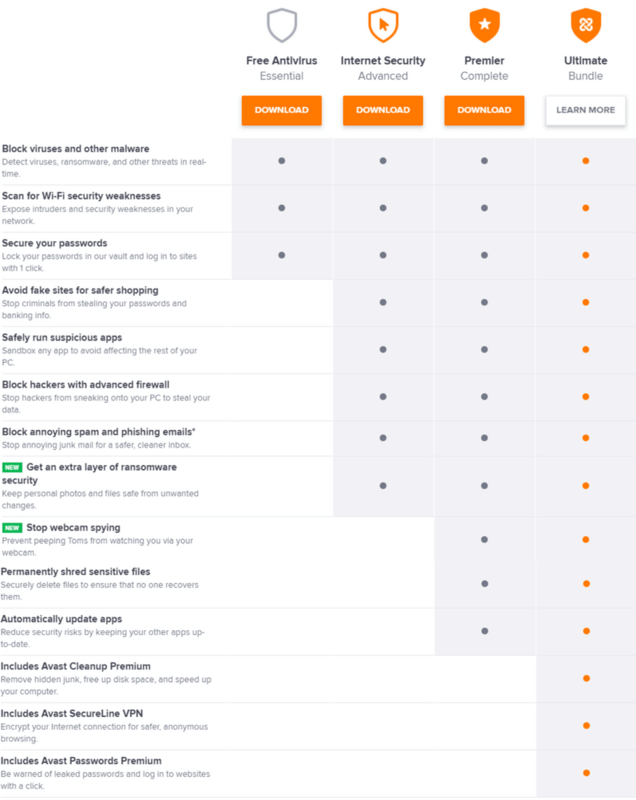 So, it’s clear that Avast provides more security-related features and extra utility tools than Norton if you do a side-by-side comparison of all the four security suites both companies offer. Norton vs Avast: Which Software Provides Better Protection? Like most of the other antivirus software, Avast and Norton also use signature-match detection, which checks files against a huge database of known malware, and heuristic monitoring (checks for behavioral attributes of software) to detect all sorts of known and unknown malware. Anything that seems suspicious is sent to cloud servers and is added to the malware library if found to be dangerous upon further examination. Usually, all the security suites of antivirus products use the same detection engine to detect and sniff out malware. To see which of the two software provides better protection, I’ll look at their performance in the recent independent lab tests conducted by AV-Test and AV-Comparatives – two reputable institutes that regularly test the performance of various antivirus on different levels. Now, let’s see how both products fared in AV-Comparatives’ tests. received an excellent “ADVANCED +” award because of its great protection rate of 99.6 and a low wrongly blocked score (which was calculated based on how many times the software wrongly blocked clean files/websites) of 11.
perfect at 99.9% but its wrongly blocked score was higher, at 20, which means it secured a slightly lower “ADVANCED” status in the real-world protection test. 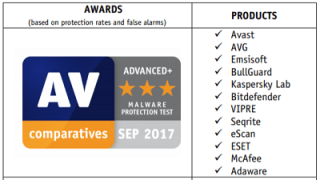 In AV-Comparatives’ malware protection test, Avast once again received “ADVANCED +” award as its protection rate was 99.99%, only returned 9 false positives (i.e. wrongly identifying clean software as malware). On the other hand, Norton’s results in this test were poor. Its protection rate was great, at 99.99%, but it returned 275 false positives, a remarkably high number. It received the lowest “TESTED” status in the malware protection test. So, it’s evident that Avast not only detects malware at a great efficiency but also returns very few false positives. Norton vs Avast: Which Product Puts Less Impact on System? It is imperative that antivirus should not only provide great protection against malware but also shouldn’t eat up too much of system resources. Back in the day, Norton was known for making computers sluggish, but that’s not the case anymore. 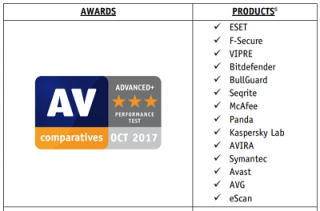 AV-Test’s recent “performance” study looked at the average influence of different antivirus products on computer performance by carrying out common tasks like launching websites, installing and downloading applications, copying of files, and more. Norton received a great overall rating of 5.5/6 stars. (The results are expressed in terms of percentage slow-down on a standard and a high-end computer). And here’re the results of the same study with Avast installed. Note: These tests were conducted in Sep-Oct 2017 on Windows 10. The same tests when conducted on Windows 7 platform in July-Aug last year saw similar results. like file copying, archiving/unarchiving, installing/uninstalling apps, launching apps, browsing websites, and more. Avast’s impact score was 8.9, while Norton touched a slightly better 8.7 mark. Both software were awarded “ADVANCED +” rating in this test. So, it’s clear that neither Avast nor Norton will significantly slowdown your computer, but it has to be said Norton is slightly better in terms impacting the system. Norton vs Avast: Which Products Provides Better User Experience? Norton’s clean and bright user interface hasn’t changed in the recent years. When everything is okay, you’ll see “you’re protected” written next to a green check mark, which quickly changes to a red cross when you’re under threat. It has four tabs arranged in a horizontal menu – Security, Identity, Performance, and More Norton. There’re links to Report Card (gives you an overview of Norton’s activities), Setting, and Help in the top bar. At the bottom, there’s information about your subscription status, with a link to subscribe. Security tab, which is the default window, lets you run different types of scans, update malware definitions, access protection history, and turn on/turn off advanced options. Identity covers web protection features, identity safe vault, and a password generator. Performance tab contains features like disk optimizer, startup manager, system graph and a file cleanup option, while More Norton enables you to manage your devices and add more features. Avast’s dark interface looks modern and elegant, but it may come across as a little more complicated and overwhelming when you compare it with Norton’s interface. It has a vertical menu on the left that has the following tabs: Status, Protection, Privacy, and Performance tabs. Status, which is the default home page, shows protection status, with the green color representing “everything is fine” and the red color signaling a problem. The other three tabs neatly open submenus that contain relevant features associated with each tab. At the bottom-left, there’s a link which takes you to the settings page, and on top of that lies an “Upgrade” button. If you’re using the free version, you’ll see that many premium features are locked. Also, Avast shows unobtrusive ads in its free plan. Overall, Norton’s product provides a better (and cleaner) user experience than Avast’s. Norton vs Avast: Which Software is Less Expensive? First, let’s see the prices of Norton’s security suites. Now, let’s look at the prices of Avast’s solutions. Avast’s security suites are a touch expensive than Norton’s. Also, you can protect multiple devices with a single license of Norton Security Deluxe and Norton Security Premium. Norton vs Avast: Which is More Popular? Avast claims to have a user base of 400 million, but it includes AVG users too since they both belong to the same company. On the other hand, Norton’s community is speculated to be just over 50 million — considerably lower that Avast’s. OPSWAT’s most recent antivirus market share report shows that Avast leads the overall market share by 19%, followed by ESET and Malwarebytes with 14.03% and 12.73% respectively. Norton, interestingly, didn’t make it to the list of top 10 antivirus products in terms of market share. Another way to judge which of the two products is more popular is to look at the social numbers. Avast has 4.1 million Facebook fans while Norton’s numbers are just over 1.3 million. On Twitter, Avast has 182K followers as opposed to Norton’s 157K. So, it’s clear that Avast not captures a bigger market share but is also more popular. In the modern, technology-driven world, we store a large part of our life on our computers, so it makes sense to say that you should never take your security and privacy for granted. A lot to digest between the two! You’re correct! That’s a lot of information. Muito obrigado em compartilhar, foi muito útil. Got to know about the new ransomware. my norton antivirus is protecting me 365 days without any interruption so i am not worried about the new ransomware. Confusing article. You begin by comparing Avast and Norton and then you conclude by recommending BitDefender, which you didn’t even review? Also, it’s hard to believe that Avast has more of a system impact than Norton. After Windows updates screwed up my computer, I tried to do a reset, but the Windows reset failed, saying that a Norton file was blocking the reset procedure. My PC also ground to a halt while using Norton. The problem may have been caused by a virus, but Norton clearly did nothing to fix it. I was on the phone for 7 hours with Norton, during which time they tried to reset my computer twice, both times taking almost 3 hours and ultimately failing due to the continued existence of a Norton file. If Norton can’t even stop their own software from screwing me up, how can they prevent other viruses from attacking? I finally had to take my PC in to Best Buy and replace the entire hard drive. I can imagine what you had to through as I had a similar experience back in the day. We have reviewed over 50 antivirus packages from the biggest brands in cyber-security. Overall, Bitdefender is our recommended antivirus software as it performed extremely well (and better than any other antivirus software) in all the categories we considered. You can see how Bitdefender compares to Avast here.